Ryland Peters & Small, 9781788790734, 144pp. It’s the unassuming ingredient that has become a force to be reckoned with. 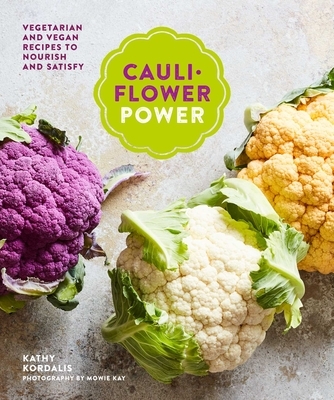 Whether roasted, smashed, whipped, pickled, or braised, each cooking method gives it a new dimension of flavor, and these 60 recipes show off the myriad ways cauliflower can be enjoyed. A master of disguise, it can be a great undetected base and substitute for less nutritious carbs, or it can take on other flavors and quite easily star as the main event itself. As well as being utterly delicious, cauliflower is also a super-healthy ingredient—a good source of fibre, omega-3s, B vitamins, and minerals. Try Crispy Cauliflower Katsu Curry, Whole Roasted Lemon and Oregano Cauli with Pitas and Yogurt Dressing, Umami Cauli Steaks, Quick Cauli Saffron Pilaf, Freeform Cauliflower Tart, Smokey Cauli Arancini, or even Deepest Darkest Caramel Brownies! Raised by Greek parents in Sydney, Australia, Kathy Kordalis’ food style is light, relaxed and accessible, drawing inspiration from her Australian and Mediterranean heritage. A graduate of Leith’s School of Food and Wine, Kathy originally moved to London and entered the professional food world in a management role at the Divertimenti Cookery School. Now working as a freelance food stylist and writer, her clients include Tesco Online and Waitrose Food Magazine, as well as chef Bill Granger, for whom tests and develops recipes for his three Granger & Co restaurants in London. Kathy is currently completing a Masters degree in the Anthropology of Food at SOAS and leads popular Gastronomic Tours in central London for Context Travel.